Mersen has gathered together the latest technical innovations illustrating the Integrated Architecture approach that can be offered to our inverter manufacturer clients. Mersen’s integrated architecture approach helps inverter designers save time by optimizing the selection of key components, benefiting from a solution that is pre-designed for their specific application. Busbar, fuses, cooling, gate-drivers, capacitors, and connectors can now be optimally designed together, in one step to meet electrical, mechanical and thermal challenges of the system. Mersen Semiconductor protection fuses are used to protect against over-current conditions in power electronic equipment. 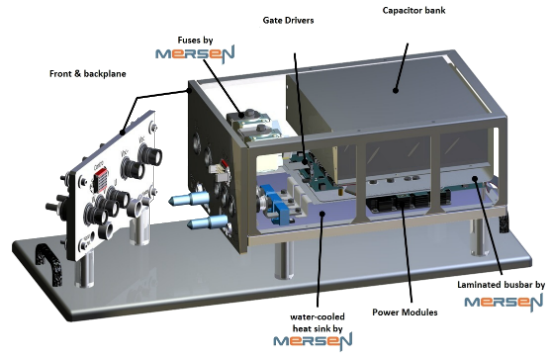 Mersen’s dedicated power electronics team is available to customize a solution for you. Make Mersen your power electronics protection partner, and you’ll discover a powerful ally that can help you protect your people and equipment. Click here for more information.